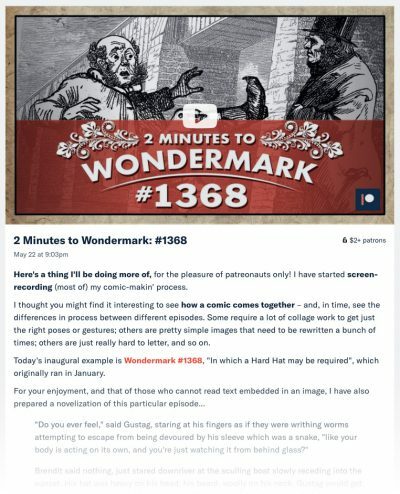 I’ve just started a new series on my Patreon page, where I provide commentary over a 2-minute timelapse of the process of creating a Wondermark comic! 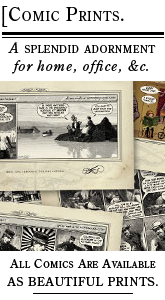 The first two installments are up now, exploring the making of comics #1368 and #1369, which is the point at which I decided I would start recording my work. In those posts, I have also written “novelizations” of both those comics! In case you want to learn more about the rich inner lives of the characters who say the quippy things. I don’t know if I’ll do that every time, but I have done two so far and will probably do a few more in the next few installments. 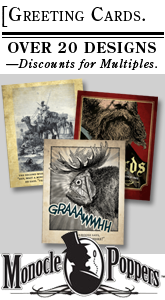 If you’re not familiar, Patreon is a website where you can subscribe to premium content from artists like me — in this case, a contribution of $2 per month (which works out to $24 a year) makes you a patron of Wondermark and gets you access to all special posts I have, or will, write. It doesn’t sound like much, but a bunch of people contributing small amounts like $2 can really add up and make a big difference. 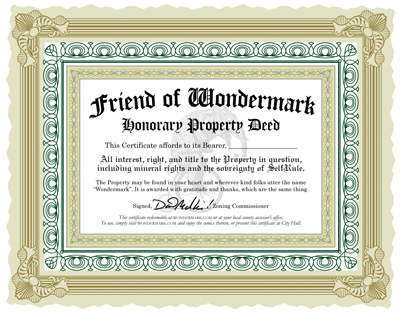 If you’re interested, you can become a patron at the link below, and get access to the 2 Minutes to Wondermark posts as well as past essays, such as the Archive Dive series and two journeys through the Roll-a-Sketch Vault. I’ll be adding more installments to those series over time, as well! Not on any strict schedule, just as I have the time. 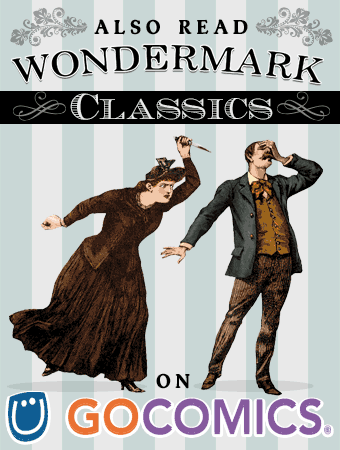 Meanwhile, the third installment of the 2 Minutes to Wondermark series goes up tomorrow!! This entry was posted on Thursday, May 24th, 2018 at 12:00 am and is filed under Blog. You can follow any responses to this entry through the RSS 2.0 feed. Both comments and pings are currently closed.